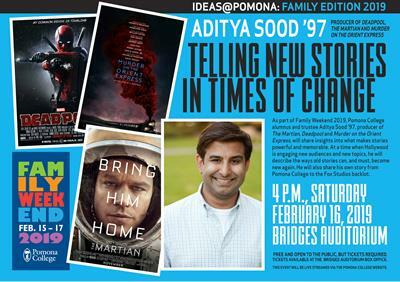 As part of Family Weekend 2019, Pomona College alumnus Aditya Sood ’97, producer of The Martian, Deadpool and Murder on the Orient Express, will share insights into what makes stories powerful and memorable. At a time when Hollywood is engaging new audiences and new topics, he will describe the ways old stories can, and must, become new again. He will also share his own story, from Pomona College to the Fox Studios backlot. Sood will be joined in conversation by Assistant Professor of Media Studies, Kevin Wynter. Sood is the president of Simon Kinberg's production company, Genre Films. Most recently, he was an executive producer of the hit film, Deadpool 2, based on the Marvel Comics character, which opened in June 2018. He is also an executive producer on the Netflix political thriller Designated Survivor, which is currently shooting its third season. In 2017, he was an executive producer of Murder on the Orient Express, and is an executive producer of its upcoming sequel, Death on the Nile, due out in 2020. Previously, Sood was a producer of the Golden Globe-winning and Oscar-nominated 2015 film The Martian and an executive producer on the 2016 blockbuster Deadpool. Genre Films has a first-look deal at 20th Century Fox. Prior to working at Genre, he ran Walter Parkes and Laurie MacDonald's production company at DreamWorks and was vice president of production at Warner Bros. Pictures. He started his career at New Line Cinema and DreamWorks and later as a story editor for producer Mark Johnson. 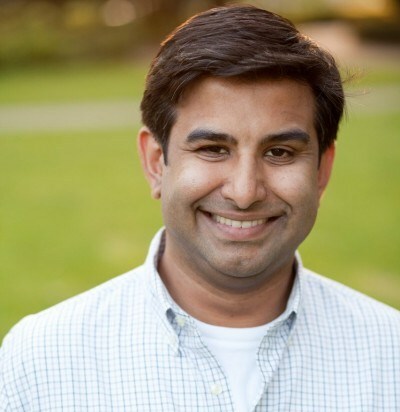 Sood graduated with a degree in politics, philosophy and economics from Pomona College, where he currently serves as a trustee.